It all started a few weeks ago when Georgia State Representative Allen Peake visited four-year-old Haleigh Cox, the daughter of one of his constituents. He witnessed first-hand the devastating effects of Haleigh’s disorder, a condition that afflicted the young child with close to a hundred seizures a day. The little girl’s parents told him about cannabis oil and how it helped similarly afflicted children in Colorado. They also told him about their plans to move to Colorado so Haleigh could legally obtain cannabis oil, a natural medication that has the potential to reduce the severity and duration of her seizures. The experience changed Allen Peake’s stance on medical marijuana. Medical marijuana is a strain of the Cannabis plant that is high in cannabidiol (CBD), unlike recreational marijuana, which is high in tetrahydrocannabinol (THC). While research is still ongoing, CBD has been shown to have many different beneficial properties. It differs from THC in several ways, the most notable being that CBD does not give users a high. Peake introduced the bill, nicknamed “Haleigh’s Hope Act,” in the Georgia state house on January 28. The bill was co-sponsored by over 80 Representatives, including Mickey Channell, Tom McCall, and Ben Watson. 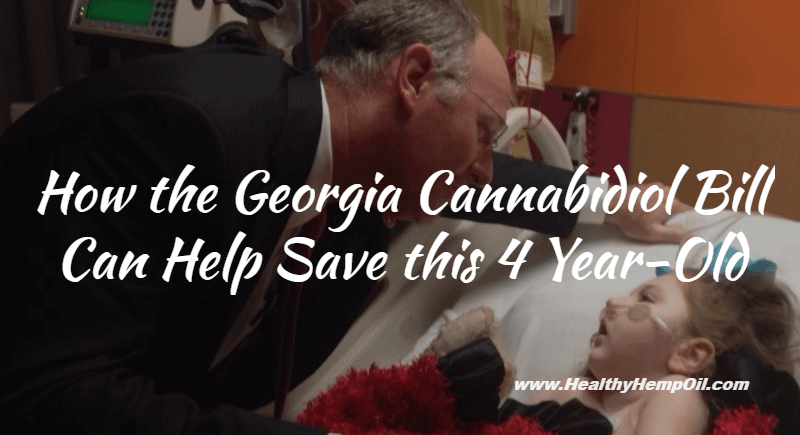 Through this bill, Allen Peake hopes to make medicinal cannabis available to those in Georgia who really need it. Medical marijuana is currently legal in 20 US states, none of which are in the south. However, 10 other states, including Alabama, Florida, and Tennessee, are considering legalizing it. Representative Peake is very clear on the fact that the bill is not a step towards legalizing recreational marijuana. The bill will legalize medicinal cannabis in a “tightly restricted, very regulated, doctor managed process” only for patients with seizure disorders. Though the bill would make the cannabis medication available to patients, it would not be available at every drugstore. Only a select few research centers in Georgia would dispense the cannabis. The bill also limits the form of the cannabis to an oil extract that can be administered orally. Peake currently plans to obtain the CBD oil from Colorado, where companies are producing cannabis oil suitable for medicinal purposes. Since cannabis products are not allowed in Georgia, there are no local means of extracting the oil. The legislative session ends in March, and Haleigh’s Hope Act (HB 885) faces a tough road ahead, but it does have the support of the Medical Association of Georgia. If the bill passes, it will face still other challenges. The biggest challenge at the moment is that it is currently not legal to import cannabis compounds in Georgia. Even Allen Peake abstained from bringing a bottle back with him after a visit to Colorado because it would have been a felony. Though it is unclear how CBD oil would enter the state, Allen Peake believes that universities could provide a legal pathway. Haleigh’s Hope Act does seem to have a good chance, despite the challenges it faces. If it becomes law, families of children suffering from seizures in Georgia will be able to obtain cannabis oil in the state legally, eliminating the need for them to uproot their families and move to another state where the drug they need has been legalized. Visit Allen Peake’s website for more information and updates on HB 885. Sign up below for our mailing list to get CBD news delivered right to your email inbox. We deliver the latest news and the occasional giveaway or promotion for our loyal readers.. This entry was posted in United States CBD Policy and tagged Georgia.